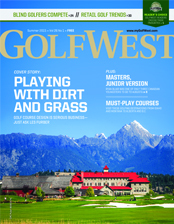 We are now offering a complimentary subscription to GolfWest magazine. Simply fill out the information below and we will mail you a copy absolutely free. GolfWest is published once a year and is packed with golfing destinations throughout Western Canada and the Pacific Northwest, as well as new golf products, tips and much more. Our monthly GolfWest eNewsletter keeps you up to date with popular columns, golf news and golf destinations throughout Western Canada and the Pacific Northwest, as well as new golf products, tips and much more. Our GolfWest Online Magazine is an exact copy of the print magazine that can be viewed on your mobile device or desktop. We will send an email notification whenever the new edition is available. GolfWest is only available to residents of Canada and the United States.